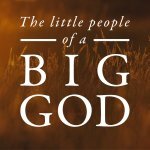 "The Little People of a Big God"
If we want to know how God will treat people in the future we should pay careful attention to how He treated them in the past. The book of 1 Samuel lays down a pattern of God’s dealings with men. Will He chose the impressive or the non? Will He bless the proud or reject them? Will He exalt the mighty or the needy? Understanding the divine pattern will instruct us in being the ones who find favor with God. Will You Enter the Work of the Lord?